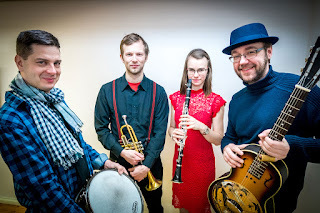 "A particularly successful experiment in combining Mississippi Delta blues with New Orleans jazz," (Theo Volk, Music That Needs Attention, Holland), the Sawmill Roots Orchestra was founded in 2017 with the original line-up of Aveli Paide on clarinet, Aigor Post on trumpet, Raul Terep on drums, and Andres Roots on guitar. The band's first single "Meow Meow/Sawmill Stomp" was released in October 2017, their debut album on March 2, 2018. The German Global Music Magazine describes the record as "blues of a new, unheard variety... An unorthodox, cool and extremely swinging blues album," with the legendary Raadio 2 DJ Koit Raudsepp calling it "the hottest album in Estonia today." The Sawmill Roots Orchestra appeared at festivals such as Sundays Blues Festival in Latvia and Tartu Bluusikuu, Underground Blues and Prima Vista in Estonia - at the latter, the band provided live music for two Buster Keaton silent films: "The Balloonatic" and "Cops". The band's last gig was at the Sõru Jazz festival in Hiiumaa in June 2018.